Groups of 9 or more receive $5 off of select tickets! TICKETS AVAILABLE at the Verizon Arena Box Office, charge by phone at 800-745-3000 or on line at www.ticketmaster.com. Celebrate what’s possible as five Disney heroines spark the courage inside us all at Disney On Ice presents Dare to Dream! 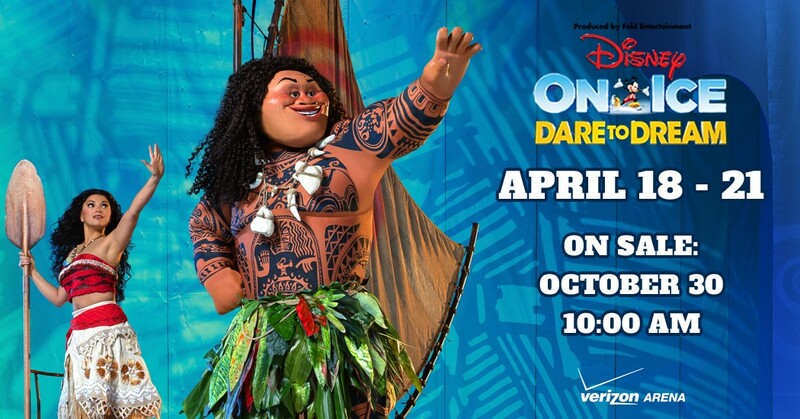 In her Disney On Ice debut, see how far Moana goes on a quest with demigod Maui to save her island and find her own identity. Anna’s devotion to her sister Elsa sets her on a journey to stop an eternal winter. Rapunzel goes to great lengths to realize her dream. Fearless Belle befriends the enchanted castle staff and uncovers the Beast’s gentleness. With help from her friends, Cinderella is determined to make her wish come true. Along with Mickey and friends, discover your inner hero at Disney On Ice presents Dare to Dream! *Note: Costumes not permitted for guests 14 years & older.